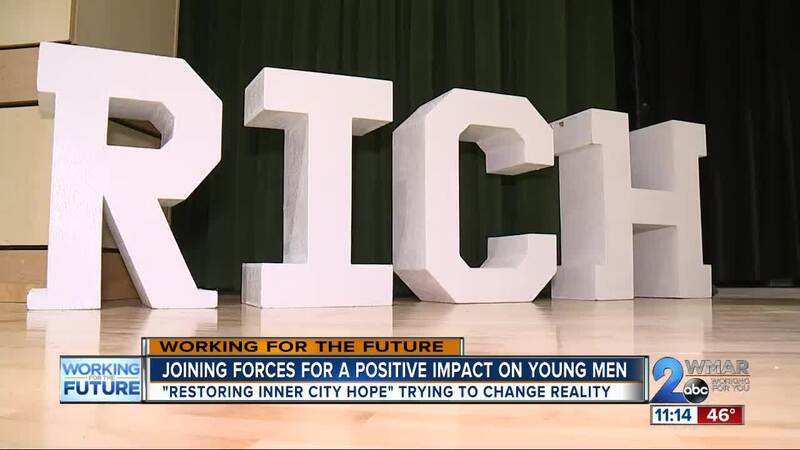 The goal of RICH, Restoring Inner City Hope is to change that reality. It was like a pep rally. But instead of cheering on their team, these teens were rooting for themselves, their community and the youth of Baltimore. “Reality right now is kids being killed, drive by shootings and stuff like that. Bad things going on around us,” said Karif Almond Jr. Dozens of teens were there for motivation, a meeting of the minds and words of wisdom from male role models at Cherry Hill Elementary Middle School. “We want to let them know that we're here. That we love them and there are opportunities for them and just expose them to those opportunities,” Michael Battle, Executive Director. Opportunities like owning a business like Michael Battle who owns a clothing line. But they also tackled topics like trauma, and how growing up in tough neighborhoods can lead to mental health challenges and bad choices. “A lot of times we say get off the corner, don't sell drugs, but we have to put something in place to make it make sense for them to get off the corner and not sell drugs," said Battle. Karif Almond Sr. that came with his 17-year-old. “Anytime I have an opportunity to expose my son to anything positive, dealing with building himself up, building the community up, I like to participated and assure that he's there,” said Karif Almond Sr. The event was fun but had a focus on the future. “We have to life up kids our age, kids from kindergarten all the way up. You have to lift these kids up and make sure they have a positive mind set about what's going on around them and how to build on that,” said Karif Almond Jr.